The Transfer from Jerusalem to Constantinople of the Relics of the Holy FirstMartyr Stephen occurred in about the year 428. After the holy FirstMartyr Archdeacon Stephen was pelted with stones by the Jews, they threw his holy body without burial for devouring by the beasts and birds. The reknown Jewish law-teacher Gamaliel, having begun to be inclined towards faith in Jesus Christ as the Messiah and also defending the Apostles at the Sanhedrin (Acts 5: 34-40), on the second night sent people devoted to him to take up the body of the Firstmartyr. Gamaliel gave him burial on his own grounds, in a cave, not far from Jerusalem. When in turn there died the secret disciple of the Lord, Nicodemus, who had come to Christ at night (Jn. 3: 1-21; 7: 50-52; 19: 38-42), Gamaliel likewise buried him nearby the grave of Archdeacon Stephen. Afterwards Gamaliel himself, having accepted holy Baptism together with his son Habib, was buried near the grave of the FirstMartyr Stephen and Saint Nicodemus. In the year 415 the relics of the saint were uncovered in a miraculous manner and solemnly transferred to Jerusalem by the archbishop John together with the bishops Eleutherios of Sebasteia and Eleutherios of Jericho. From that time began healings from the relics. 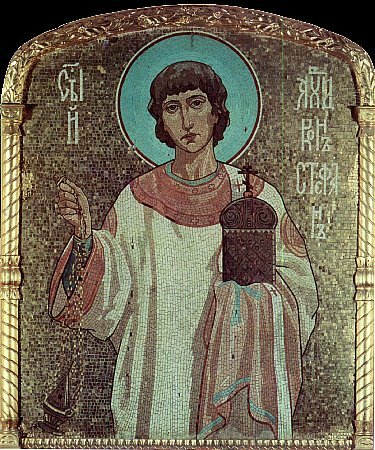 Afterwards, during the reign of holy nobleborn emperor Theodosius the Younger (408-450), the relics of the holy FirstMartyr Stephen were transferred from Jerusalem to Constantinople and placed in a church in honour of the holy Deacon Laurentius, and after the construction of a temple in honour of the FirstMartyr Stephen the relics were transferred there on 2 August. The right hand of the FirstMartyr is preserved in the Serapionov chamber of the Troitsky-Sergiev Lavra.